It is the season of the Sparkle Minnow. Luminous, iridescent and sparkle, these flies have great action as they pulsate through the water. 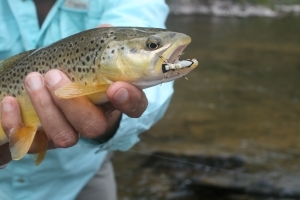 It is almost criminal how they prey on Brown Trout. The Jefferson, with clouds has been easy pickings.